Modern DJ equipment can be expensive and really hard to distinct and compare. To make an impact as a DJ, you need the best DJ controller money can buy. The problem arises, when you have to pick one, especially if you’re just starting out. That’s why we’re here today; to help you get the best one for yourself. Why Do You Need a Dj Controller? This is the first question that might come to mind. After all, you might be doing fine with just your laptop, and don’t understand how a controller would make things any better. For starters, let me explain what a DJ controller is exactly, as there might be some misconceptions. Some people think it’s just a fancy toy, but that’s far from the truth. What a DJ controller offers is ease of control. While using a laptop, you might have to look through multiple menus and click a lot before you get to the option you want. That wastes time and stalls your show, which is not something you want. With a DJ controller, everything is simple and at the tip of your hand. You can do pretty much anything with the turn of a knob or a press of a switch. Whether it be mixing, scratching, adding effects or navigating your library, it’s all simple. In the middle of performance, this is invaluable. However, that doesn’t mean you just junk your laptop – it’s still a necessary component. It’s just not your primary tool anymore. That’s not everything a DJ controller offers. Most of them usually have an integrated sound card, eliminating the need to buy a separate one. Some can also be used to help you make new music, even on the fly. Your laptop is still necessary, as the DJ controller has to interface with the appropriate music software in order to work. You might have heard about hardware with a similar use as a DJ controller, and are having some doubts. Because of that, I will outline some benefits and drawbacks that DJ controllers has over such gear. For starters, there’s the more ‘classic’ option – Turntables. This is a pair of record players, connected to a DJ mixer and manipulated by hand in order to produce effects. Even the best pair of cheap turntables is more expensive than the best cheap DJ controller. Not to mention that a controller is far more portable. Turntables require a lot of skill to use, so DJ controllers are more accessible for most. Still, turntables do offer a more tactile feel and are rewarding to use if you put in the effort. Another alternative to a DJ controller is a pair of CDJs – specialized CD players which emulate the feel and function of turntables while adding some digital benefits and other features. DJ controllers don’t require a DJ mixer, which is an obvious upside. Controllers are still quite cheaper than CDJs. They also require less skill and practice to use. On the other hand, controllers require a laptop present, while CDJs do not. CDJs are also present in most clubs, so you don’t have to bring your own most of the time. The choice, in the end, is up to you – but for most people, I’d recommend using a DJ controller. One of the biggest factors in choosing a DJ controller is the software you’re using, as it only allows you to control that software. 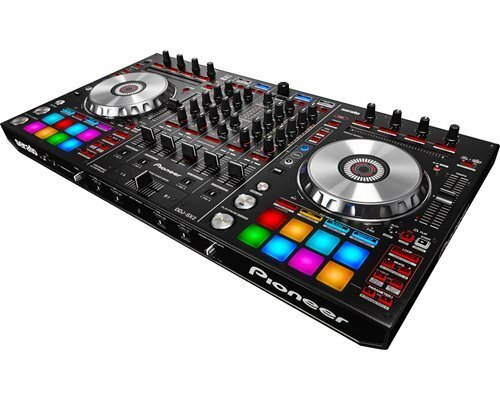 Most commercial ones, even the best Pioneer DJ controller you can get, are compatible with only a few. However, most can also be re-mapped to work with other software, but that’s tricky. Some buttons, knobs, and sliders might work differently, or not at all. There are few things to consider here. First is your preferred price point. Are you looking for the best budget DJ controller or do you have money to spare? Then, there’s your choice of software, as I mentioned. You’re probably already using something, so always check if the controller you want fits your software. You must also consider what other features do you want out of your controller. Do you have any gear, besides a laptop and headphones, which you intend to hook up to it? What kind of knobs, sliders, faders, and other control features are you looking for? There are some other things you might want to think about. There’s the look, or the size and weight if you need it to be portable, the quality of the materials, and so on. This is a controller made for the use with the Serato DJ software, primarily. Serato is a rather popular piece of software nowadays, but might not be for you so take that into consideration. However, it is a MIDI controller, which means it can work with other software that uses the MIDI protocol. The design of this DJ controller features two really large jog wheels, for the best simulation of the turntable experience. In addition to that, it has good tactile performance pads and a manual filter. You can clearly notice the USB support, as well as a built-in soundcard. The controller is compatible with Windows 7 and upwards as well as with MAC OS X 10.8 and upwards. The size is 13.5 x 22.9 x 5.2 inches while the weight is 6.7 pounds, making it reasonably portable. The materials this controller is built from seem very cheap, and the jog wheels wore out fast, leading to many mishaps. The gains and faders also started malfunctioning not long after that which is a shame. It worked well before that, though it did have some strange issues interfacing with Serato. Still, this is probably the best DJ controller under $300 that you can get. This is a mid-range DJ controller from Pioneer, designed for usage with the Serato DJ software. 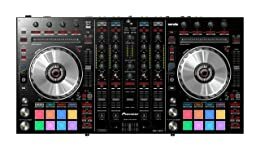 It even has specific buttons built in for some Serato functions and features 4-channel performance. The jog wheels on this one feature something they call “Hot Cue Countdown” – a system that lets you easily identify where hot cues are on the tracks that you play. In addition to that, there is also the Serato FLIP function, which lets you record and playback loops on demand. These two features combined make loops pretty easy. 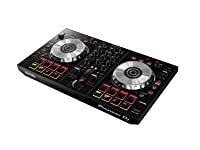 This DJ controller has a size of 6.9 x 29.9 x 17.7 inches, as well as a weight of 16.5 pounds, which puts it on the heftier side, but you can carry it around rather easily. That’s all fine and dandy, but there are some significant problems here. For starters, it had issues working with the Serato software it was designed to work with. That really shouldn’t happen. It also seems to be made from flimsy material, as some switches started breaking after a while. At some points, it also just refused to work outright. On Windows, it tended to have some issues with the sound drivers, but on Mac, it worked fine. Based on your preferences, you will have a good time with DDJ-SX2. Another mid-range DJ Controller made with the Serato DJ software in mind, this time from Numark. 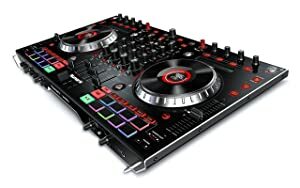 This one actually comes with a full version of Serato DJ included into it, which is great for the price. Not all controllers come with the software. It features two USB ports, allowing you to plug in two laptops into it at the same time, allowing for easy hand-offs. Works well to prevent all the messy disconnecting and reconnecting and setups in the middle of shows that feature multiple DJs. Another thing it has going for it is an independent mixer, with two phono/line inputs, allowing for mixing without software. There are also the two nice, 6-inch jog wheels that feel nice under your fingers. The two integrated sound cards are also a big plus. The size is 13.8 x 22.4 x 2.6 inches, while it weighs 9.2 pounds. Not too light or too heavy. However, as nice as the jog wheels are, they tend to lose their scratch mode in the middle of performance, leading to nasty sounds. Another issue is that it’s not easy to use out of the box – it requires a lot of fiddling and maybe opening it up. Not good if you are a beginner. Now, this is a really different DJ controller, as it has one standout feature that most others don’t have – it’s standalone. Meaning, no laptop needed to use it. It’s made to work with Serato DJ software, but it has that inbuilt. The two high-definition displays on the top left and right allow you to see the specifics of the Serato software operations. In addition that, it has its own unique Engine software, featuring some built-in effects. It also contains two USB ports on the back that you can use for multiple purposes, whether for hand-offs or the use of external hard drives. With its size being 17 x 28.7 x 2.8 inches, and weighing around 18.4 pounds, it’s on the bulkier side and difficult to carry around. However, it seems rather sturdy, and nothing broke even when I accidentally dropped it. Great stuff. However, the placing of the buttons and knobs is quite weird, hard for you to get used to. After a while, I got into it though. There’s also another issue, for Windows users. It only works on Windows 10, nothing less than that. It also might not work on some older Macs, so you should beware. 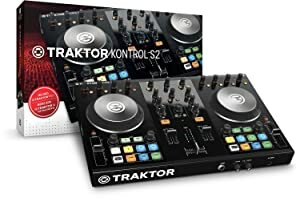 This controller is different from the others in that it uses Traktor software instead of the usually and popular Serano DJ. However, that has its benefits as it more easily interfaces with iPhones or iPads, which it makes it better for mobile use, as you don’t need to lug a laptop around. Combined with its size of only 22 x 5 x 13 inches and weight of 8 pounds, it’s a very portable controller. However, while the software works great with Apple products it tends to crash a lot on Windows and Mac, and it’s not ideal to use it with laptops. The fact that it’s so light also means that it’s made from flimsy material and breaks rather easily as I found out. The crossfaders also died on me pretty fast. The mic input also doesn’t seem to work as intended. It’s difficult to control the sound levels and it won’t go as loud as it should. Even after looking up fixes, it’s still not quite right. However, the button layout on it is pretty simple, and I like the design overall. Rather easy to use right of the box, and the price point is right. If you’re a beginner, this one is great for you. It’s hard picking a clear winner here, as all the DJ controllers I’ve listed have served me well, in different situations. However, the best one for me has got to be the Denon DJ MCX8000, as it provides pretty much anything I need. Yes, it might not be very portable, but the fact that I can use it without needing a laptop, and use it well, more than makes up for it. The price point is high, but again, the fact that it has built-in software covers that price easily. I can still keep track of the software almost as good as if I did have a laptop while focusing more on the music at hand. That’s something not a lot of DJ controllers offer, especially not the other ones listed here, and it’s just what I need. Also, unlike others, it’s really sturdy, and I think I’ll be getting some good use out of it for years to come. 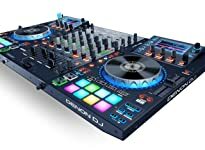 So, that’s my pick, and I think it’s a pretty good DJ controller for most people, both veterans, and beginners. However, you might need something else, in which case I hope this article helped you decide on what to get.